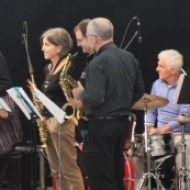 PLAYJAZZ is a series of open workshops for adults that offers the opportunity to play in a structured supportive environment. Each month our project leader Matt Ratcliffe sends out charts and video/audio clips of two or three tunes. PLAYJAZZERS then come together to play and improvise in small groups under Matt’s guidance. It really helps Matt plan the sessions if you book in advance, but you can turn up and pay on the night.